The first written mention of candle clock use was recorded in 900 A.D. but they were probably in use even earlier. English King Alfred the Great is widely known for having used the device to divide his day into blocks of time reserved for different purposes like his royal duties, studies and sleep. You can make a candle clock at home that works the same way. A candle clock is essentially a candle marked at regular time intervals. As the candle burns down you can tell how much time has passed based on the markings. For your candle clock, try using a permanent felt tip marker to indicate the intervals. You can use any type of pillar or taper candle for a candle clock. Keep in mind that the thicker the candle, the longer it will take to burn. Therefore, if you want your candle clock to accurately measure smaller time increments like minutes, use a thinner taper candle. If you want your candle clock to measure long periods of time like hours, you will need a pillar candle with a wide diameter in order to last that long. The most important part of making an accurate candle clock is calibrating it to measure the desired time intervals. Candles burn at a constant rate, which is why they can be used to keep track of time, but different types of candles burn at different rates depending on their size and composition. To calibrate a candle clock, you need two identical candles, a marker and a regular clock or watch. Place the two candles side by side. Light one candle and time it for one minute. 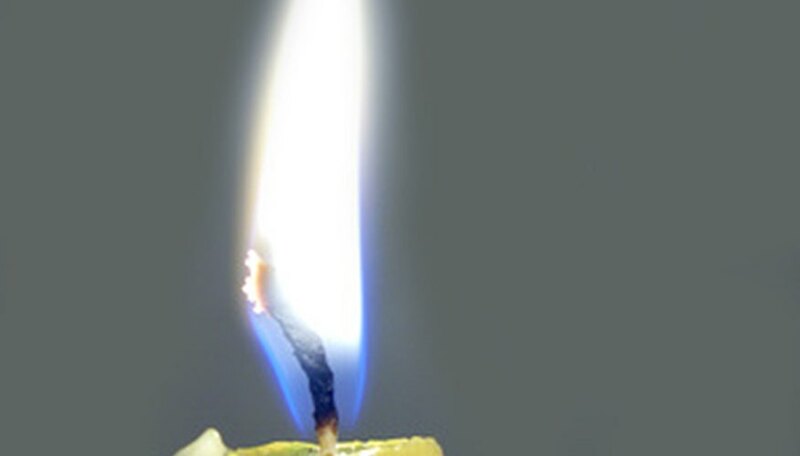 When a minute is up mark the second candle at the level of the burned candle. Continue timing one-minute intervals and marking the unburned candle for a few more minutes. Measure the distance between each of the marks. This will tell you how much that particular candle burns in one minute. Now you can make marks at that distance and know how much time has passed between each mark. Write numbers at each line so you will know how many marks the candle has passed as it burns. That way you won't have to compare it to a second candle to figure out how far down it has burned. Just remember that you have only calibrated this one specific type of candle. If you decide to use a different size or material for your next candle clock you will need to calibrate it again. For large candles you may want to calibrate if for intervals of 30 minutes but choose any time interval you want. A candle clock can tell you how much time has passed, but only if you remember to look at it. If you want to use your candle clock as a timer like King Alfred did, you need something to let you know when your allotted time is up. One way to do it is with a nail and a metal plate. If you want to time five minutes, count five marks down your calibrated candle and stick the nail into the candle. Put the candle on a metal or glass surface. When the candle burns down far enough to melt the wax around the nail, it will fall off and clatter onto the surface below to alert you that five minutes have passed.